Recorded in a number of spellings including Henden, Hendin and Hendon, this is an English surname. It is locational and has two possible meanings and origins. It derives from the village of Hendon in in the county of Middlesex, where it appears as early as the year 959 a.d. in the famous 'newspaper' of its day, the Anglo-Saxon Chronicles in the spelling of "Hendun", from the Olde English pre 7th century 'hea-dun', the high hill, or just possibly for some nameholders from the Durham village of Hendon, formerly in the first known recording of 1382 as 'Hynden', the valley of deer. Locational surnames are generally 'from' names. that is to say that they were given to people who left their original village, and having moved elsewhere, even though that may only be the next village, were henceforth called by the name of their former home by their new neighbours. This surname is well recorded in the London area, a region which in the past contained many hundreds of separate villages, and in a wide variety of spellings. These include such varied examples as Henden in 1567, Hendoone in 1581, Hendon in 1652, Hindan in 1702, and Hendin as late as 1830, when one Joseph Hendin married Elizabeth Hodge at the famous chuch of St Mary-le-Bow, Marylebone, city of London, on March 10th of that year. 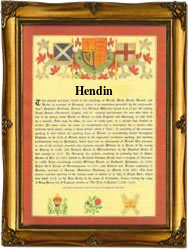 The first recorded spelling of the family name in any form may be that of Mary Henden, which was dated January 25th 1567. She married one Jesper Blanckes at Christ Church, city of London, during the reign of Queen Elizabeth 1st known as "Good Queen Bess", 1558 - 1603. Throughout the centuries surnames in every country have continued to "develop", often leading to astonishing variants of the original spelling.